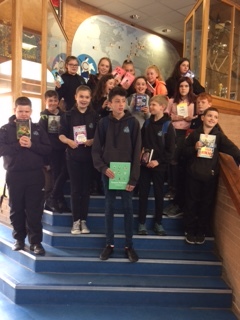 On the morning of Tuesday 12th June, the pupils who have been part of our Speeder Reader/ Read Write Inc. group throughout S1 went on an excursion to Inverness Town centre as a reward for all their hard work and achievements in developing their literacy skills this year. First stop was Inverness Library where the pupils were shown around by Mrs Appleby, Network Librarian at the library. Mrs Appleby took us to see the Reference room then it was on to see the oldest book in the library which dates to the 15th century. The next stop on our tour was the reading room where we heard about plans for a new business hub with the remainder of our visit being spent in the lending area. Here, Mrs Appleby talked to us about the variety of books and other items available to borrow from the library including graphic novels and silent books. Following our library visit, it was on to Waterstones bookshop where the pupils all chose their own book to keep. The books selected by the pupils were a broad range, from well-known authors such as JK Rowling, David Walliams and Andy McNab to books on football, sheep-rearing and mindfulness. Thank you to Waterstones, our Parent Council and Charleston Academy for funding this part of our excursion. Many thanks also to all the people who made our excursion possible – Mrs Sleet for accompanying us, Mrs Appleby for our library tour and Pete and Tom in Waterstones for advising us on books.